Why not try a Dehler yacht before you buy one. Charter a Dehler yacht here. Jan en Trees Zetzema and their crew are very experienced and enthusiastic sailors, so you will not have to do without the sporty aspects of sailing. The only thing you need to bring is food, sail clothing and sheets, which can also be rented at our office. offer a range of yachts including Dehler 34 and 36 for racing, whatever level of racing you wish to compete at, and whatever your racing needs: corporate racing, IRC club racing, Grand Prix racing, or race training Shearwater offer help. Letsgosailing has a Dehler 39 available for cruising or racing. Great Dehler 36 SQ for charter in Greece. Contact Peter Tsantes to charter "Nafkrati" through the web link. 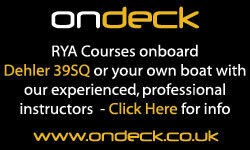 She is also available for race charter in Greece and RYA courses in Aegina Island.